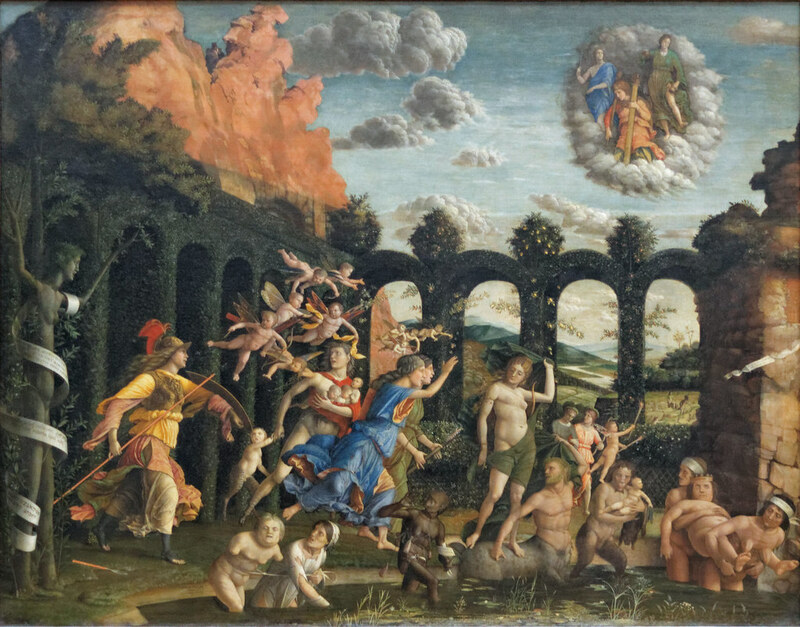 The Triumph of the Virtues (also known as Minerva Expelling the Vices from the Garden of Virtue). Mantegna, 1502. Cover art for Bernard Williams’s book on Morality. When moral judgments are confronted by scientific statements and evaluated as matters of individual opinion, a question also arises whether scientific statements themselves are just agreements among multiple systems of opinion. According to Bernard Williams, alien cultures are effected through features like geographical isolation and differences between groups of people. Due to this, it is nearly impossible to have a fully coherent belief system that can morally evaluate all the value systems that other cultures have. Because of this relativism of ideas in cultures, a belief system can only be established when compared relatively to other systems. Even when all the belief systems of other cultures are represented, it is still not a concrete system of moral judgment since it does not include the moral opinions of cultures that have the potential to exist hypothetically. This why moral judgments within cultures are relativistic to the judgments that other cultures have. They cannot establish concrete moral reference, unless an infinite number of cultures and evaluative systems are considered. As Bentham outlines, this is the problem with relativism in cultures — it can only serve as an opinion about a culture but not as a claim that is as concrete as a scientific proposition. The very notion of culture in William’s opinion, presupposes the presence of a subject-matter that outlines the differences between various cultures. Without these differences, it would not be possible to establish comparisons between them and create good moral judgment systems. In order to establish a belief system between two subjects, both of them must be exclusive to one another. It is important however, to outline differences between subjects and what makes them different from one another. Williams also clarifies that it is not sufficient to make comparisons of a subject according to its different states in time. This seems to illustrate a problem where many cultures consider history as a concrete reference to their most evaluative moral judgments. As Williams puts it, a subject’s present state in time can “merely be conjoined” with all of its previous and future states in time.1 This problem illustrates the perplexities that can arise when cultures base their moral judgments on historical references of their own culture. Different points in a culture’s history do not establish the relativism necessary to establishing good moral judgments. The most relativistic moral judgment that a culture can establish, is one that compares another culture, not the one that compares different states of its own culture through time. Williams poses the problem of moral judgment based on relativism and time as a problem of variation and confrontation. When one system is used to evaluate a moral judgment, it extends to other systems but only when it feels confronted. When systems establish judgments on their own, they typically limit their judgments within their own evaluative boundaries. When they are at a point where they feel confronted or lacking, only then would they consider evaluating the moral judgments of outside systems. This translates into a problem where systems consider moral evaluations of other systems only when there is lacking aspect of their own. This in turn translates into a system that is confident in relatively simple moral evaluations and does not seek reference from other systems. Williams also outlines a problem when evaluating two subjects that base their moral evaluations on their own value systems. The problem with asking a question to two subjects who evaluate their answers based on their own value system, is that their value systems are designed to conflict with one other. When one system is indecisive to giving a “yes” or “no” answer, and if it observes that its adjacent system is giving a decisive answer, the indecisive system would most likely choose an answer that is contrary.2 This relativistic tension between two moral sides is what Bentham defines as notional confrontation. It is certainly preferable to a moral system based on a single monopolized value system. This tension however, does not allow a conflicting moral system to become as established as a scientific proposition when some of the system’s evaluations are reactive to the evaluations of other systems. Relativism is certainly not the most insufficient mode of moral judgment, but it is not sufficient enough when compared to scientific level of judgment. Another characteristic of notional confrontation is that it places the significance of cultural systems to a lesser importance relative to scientific statements. Reason is because when a subject embraces a system of moral judgment, he is more prone to appraising its content. It therefore becomes necessary to introduce confrontations that can challenge the system. For Williams, these confrontations can be in a form of fantasy and alienated ideas; both of them can be self-encouraging and self-critical.3 This however does not address the problem of systems being inclusive in regards to moral judgments, but it does allow to introduce questions that can point towards a better moral evaluations. Although fantasy and alienated ideas do not provide concrete scientific statements, they do to certain extent, introduce modes of questioning that have the potential to lead towards critical scientific judgments. Scott, John Waugh., and Barrie Alexander. Paskins. Proceedings of the Aristotelian Society. London 1975. Print.